From pork butchers to workers in a deli meat factory, and finally entrepreneurs. This was how the adventure of our family-run business began. More than the story of a business, ours is the story of a family. Today we are larger, but our people remain the same. Our products have retained all the warmth and authenticity of a community and a land traditionally bonded to food and wine. Salumificio Pedrazzoli has always promoted practices which are forward looking in the broadest sense of the term. From projects intended for “new generations of gourmets” to wholehearted engagement in social responsibility initiatives. From pork butchers to workers in a deli meat factory, and finally entrepreneurs. This was how the adventure of our family-run business began. More than the story of a business, ours is the story of a family – the Pedrazzoli family – at the heart of which, passed down from distant generations, is the art of producing salami. Salumificio Pedrazzoli was founded in 1951 in central San Giovanni del Dosso, in the Province of Mantua – an area with an ancient culinary tradition – by our forefather Arnaldo Pedrazzoli, with the support of his wife and the help of his three sons. 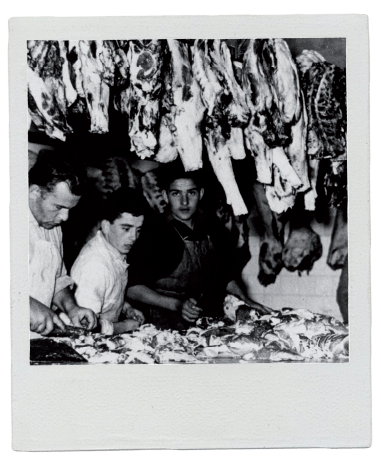 For our Arnaldo, this was the realisation of a life’s dream: from deli meat factory worker and, later, owner of the small village butcher’s shop in southern Mantua, Arnaldo became the patron of Salumificio Arnaldo Pedrazzoli, a family abattoir and deli meat factory. More than the story of a business, ours is the story of a family. And the apple certainly did not fall far from the tree. Because Arnaldo’s father, too – known as Minghin (“skinny” in the local dialect) – was a pork butcher or mazin: he went from house to house to slaughter pigs and process the meat into salami for the village families. Even today, Arnaldo’s grandchildren and their children are working for the family business, continuing to produce deli meats in the traditional ways. The Pedrazzoli generations are following in the family footsteps, with cousin Stefano working alongside the current Chairman, Mauro Pedrazzoli, together with their wives and their children Emanuele and Elisa. One of the most unique, indispensable and important “raw materials” of Salumificio Pedrazzoli’s success is its people: the people working every day, in every role, contributing their skills and passion to the success of our company. This is why, at the heart of our products, you still find all the warmth and authenticity of a community and land traditionally bonded to food and wine: those who work for Salumificio Pedrazzoli, their experience and skills, all play a central role in the process of developing the special tastes, flavours and aromas of our products. Yesterday, just like today, the calibre of our team is one of our most important “raw materials”. In this way, the quality of our team translates into a high degree of attention to detail, from choosing raw materials to expertly hand-tying the deli meats for a traditional flavour from days gone by: this approach is at the heart of who we are. It is only through this approach that Pedrazzoli deli meats can be as good as they are good. And so, through their wonderful flavour, they also tell the story of our passion, innovation, emotion and love for this industry, because we know how special it is. Salumificio Pedrazzoli has always promoted practices which are forward looking, in the broadest sense of the term. Initiatives and projects engaging with social issues, the environment, sports, art and culture in general, several non-profit organisations, Associations, Institutions and Schools, in which the firm and its farms play a role, and which have a positive impact on the local community within which Pedrazzoli acts, operates and manufactures. Looking to the future for us means looking after and respecting the environment in which we operate. We work proactively with the socio-occupational workshops run by Arcobaleno, an organisation operating in the Province of Modena on a number of projects and activities to support social integration and help develop participants’ social skills. They run day-centre activities for people with varying levels of ability, who, whilst physically able to work, have mental, psychological or behavioural conditions which mean they are unable to join the local corporate workforce. 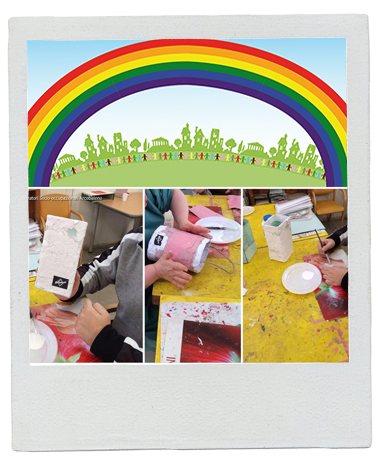 We are delighted to be involved in their “IoRicreo” project, in which participants use artisan techniques to make paper by hand out of recycled waste paper from other centres, organisations and families, commissioning them to produce the paper bags we use to promote our products. Decorated with dried leaves and flowers, sand and shells, waste and salvaged items, the intention is to raise awareness of environmental issues among those who receive the bags, to promote the “waste=resource” message and to celebrate the creativity and skill of the young people who made them.